What ended up being the last film I saw at the Chicago Underground Film Festival, Monteith McCollum‘s Hybrid, came with a certain amount of hype, having won awards at other festivals (Slamdance, South by Southwest) and such. While I have to say I enjoyed Hybrid overall, this was another film in the fest that I could appreciate much of but which I also had problems with. I didn’t really know anything about the film going into it other than that it was a documentary about a corn farmer, Milford Beeghly. Most of the beginning of the movie is interviews with Milford’s children, all well middle-aged and all of whom refer to Milford in the past tense. Early in the film, too, is a goofy TV commercial from the 1950s in which Milford, who appears to be an old man back then, is selling his new invention: hybrid corn seed. Given this introduction to Milford, I assumed that the guy was dead. But he isn’t. Or, at least he wasn’t during the making of Hybrid. There he is, lo and behold, walking through his cornfields at 99 years of age. I still don’t know why his children spoke of Milford in the past tense, but I assume he just looked old for his age when he taped the TV commercial. I also found the film to be very ironic, but not purposefully so. Also while interviewing Milford’s children, they all claim that the old man never discussed his business with his family and his kids don’t really know anything about, or have any interest in, corn growing. What I found ironic is that the film doesn’t really explain much about Milford’s lifelong passion: hybrid corn seed. 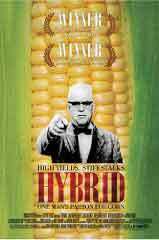 The name of the film is Hybrid and there is mention of Milford pioneering the field of hybrid corn growing, but after watching this film I have to say that I have no idea what the heck “hybrid corn” is. However, there is one good corn lesson in the film. I did learn that corn is a hermaphroditic plant. The silk is the “male” part of the plant and, as Milford puts it, whenever you take a bite of an ear of corn you’re eating a mouthful of ovaries. But maybe I’m picking apart the movie for what I wanted to be — a lesson about corn growing — and not appreciating it for the film Monteith wanted it to be — an artistic portrait about his grandfather — which isn’t a fair thing for a reviewer to do. Milford is certainly an interesting character and it probably couldn’t have been easy making a doc about a person who has a habit of being close-mouthed. In one scene, Monteith has to beg his grandfather to demonstrate his unique way of cleaning his teeth. Milford hasn’t brushed his teeth a day in his life, but he’s maintained a full set of choppers for 99 years by poking a toothpick all the way through between his teeth, leaving a little square window in his gums between each tooth. It’s quite grotesque watching Milford perform this function. But, hey, it works! I could also appreciate Hybrid‘s unique style, kind of a cross between David Lynch and Errol Morris. There’s some stop-motion animation of dancing corn peppered throughout the film and the entire movie has a pleasant, laconic, easygoing feel to it.